I’ve reached the point in building my board-game collection where the size of a box is as much a factor in purchasing as the game itself. That’s what led me to buy the diminutive Mr Jack Pocket – I had the urge to splurge and shelf space is at a premium. Plus, we’ve never really looked at a travel game on Meeple Like Us and it seems like something worth doing. It’s a little sad then that despite its name Mr Jack Pocket doesn’t skimp in the slightest on game components – we’re not going to get an opportunity to explore the accessibility of miniaturised recreation here. In the tiny box you find hefty character cards, chunky counters, and nine thick and generously proportioned tiles that make up the grid of London. This isn’t what I signed up for. This isn’t what I signed up for at all. ‘Zoinks, it was old man Williams all along!’ That’s also a great quote. 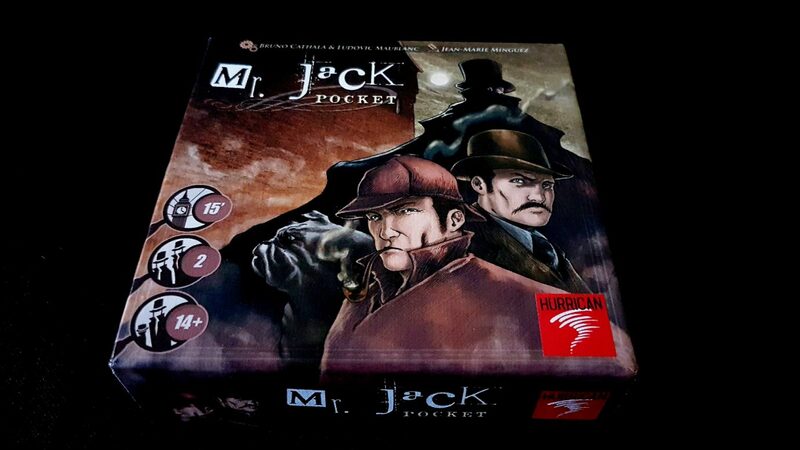 Really, the only place the ‘pocket’ moniker seems at all appropriate is in this game approaches the rules – Mr Jack Pocket is a slightly simpler version of its big brother, the unsurprisingly named Mr Jack. It’s a two player game of cat and mouse, with one player controlling ‘the investigators’, headed up by Sherlock Holmes and Watson. Oh, and Toby – a ruff character that Holmes employs on occasion to follow scent trails through the city. If you don’t remember Toby from the books his unfamiliar presence might give you paws. It might have you barking up the wrong tree, but never fear – Toby is going to be instrumental in hounding Mr Jack. Toby is a dog. I don’t know if that was obvious from these top-shelf jokes. I know ‘proper’ games with less generous components. The other player takes the role of Jack the Ripper, infamous murderer and pop culture icon. The London district of Whitechapel is made up of nine locations, each of which is occupied by a suspect. Mr Jack is a master of disguise, and one of these suspects is actually Jack himself. 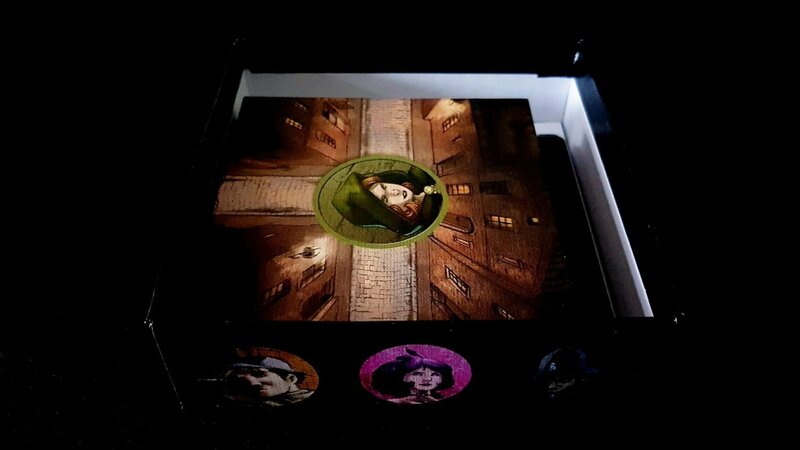 The Jack player shuffles the deck of suspects and draws one at random – that’s the guise under which they are operating. 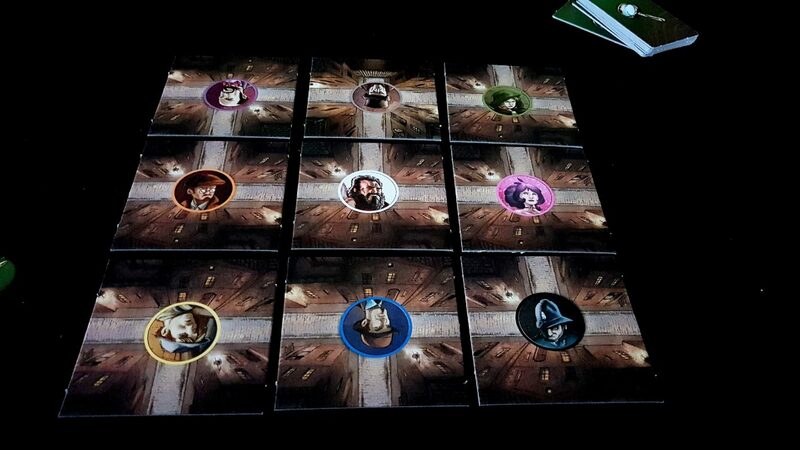 The investigators circle Whitechapel, looking to identify or clear suspects from the inquiry. Mr Jack tries to stop that happening with cunning and misdirection. If you want to rent a flat in any of these tiles, it’s £15000 a month. 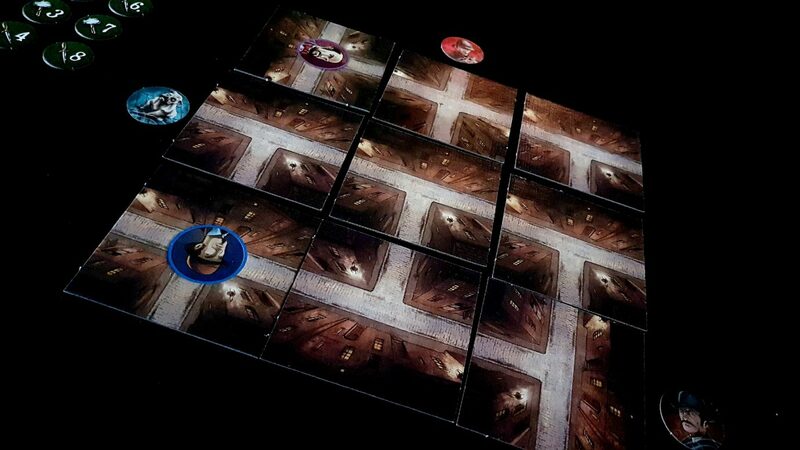 For all its simplicity, Mr Jack Pocket puts an unforgivingly intense puzzle in front of players. Odd numbered turns begin with the investigator having initiative, and even turns begin with Jack having the drop on his opponents. 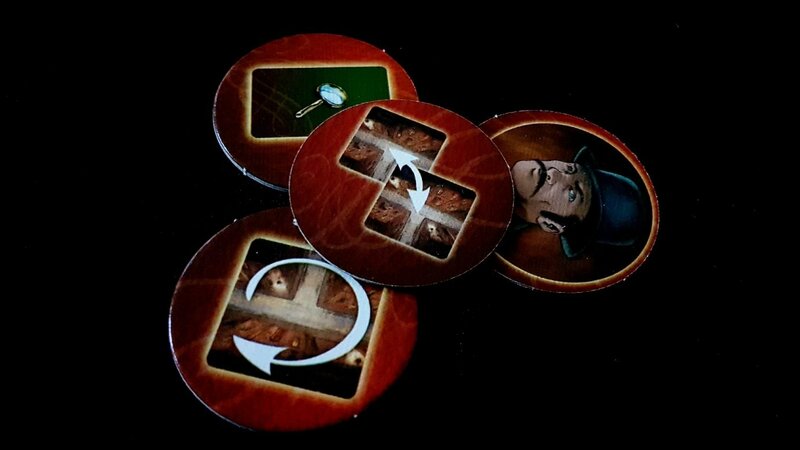 The investigators, when they go first, take the four doubled-sided game action tokens and hurl them up in the air. Whatever way they land represents the pool of actions available that turn. The investigator picks one, Jack picks two, and the investigator is left with the remaining token. On Jack’s turn, the tokens are flipped over and the rhythm of selection is reversed. The actions are profoundly limited. There’s one each for moving Holmes, Watson or Toby either one or two squares clockwise. They orbit the district like nervous schoolchildren at their first disco. 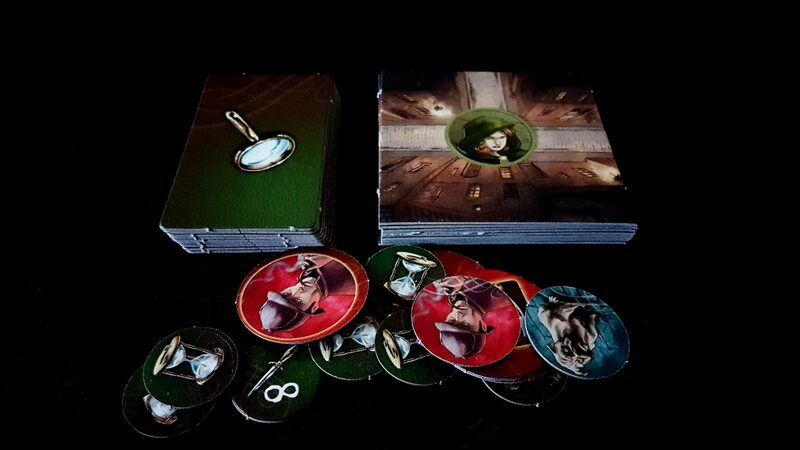 There’s a joker token that works for all investigators, but only permits them to be moved one space. 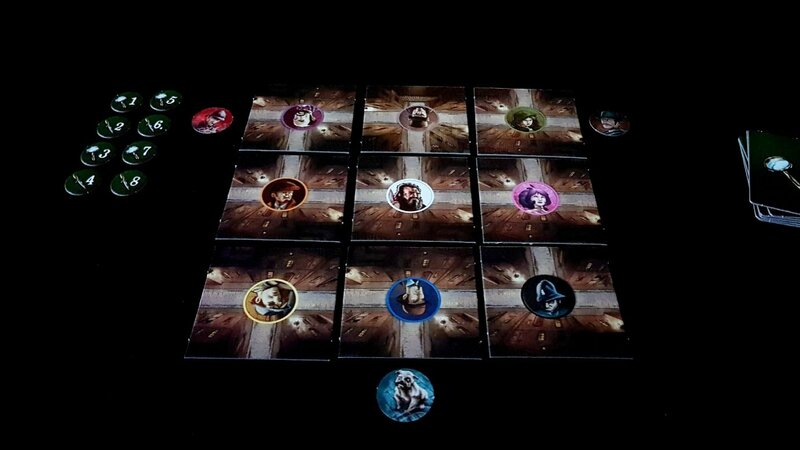 If Mr Jack picks the joker, he doesn’t have to move them at all. There’s an action that permits a player to rotate an area tile, and another that lets the player switch two tiles. This is the key element of deduction and detection. The game is built almost entirely upon the idea of line of sight. In the proper game, all the investigators would begin looking at bare concrete. I forgot to do that when taking this picture, and am too lazy to set everything up to take another one. See the grid above – Holmes and Watson have line of sight along the top row of the grid. They can see the purple, brown and green suspects. Toby has line of sight on the blue suspect. 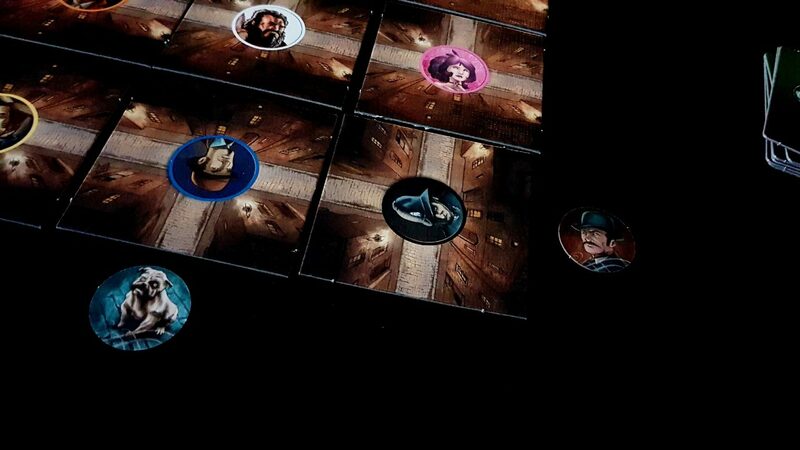 At the end of an action phase, the investigators ask if they’re able to see Mr Jack. If they are, all the suspects that are not in line of sight are removed from the game by flipping the tiles over to the empty side. If they can’t then all the suspects they can see are removed from the game, and Jack claims the current turn token and the hourglass it represents. The investigators are attempting to narrow the suspects down to a single individual. Mr Jack is trying to prevent that happening until he has at least six hourglasses in front of him. Everyone is a suspect, which means the investigators have a tricky task ahead of them. 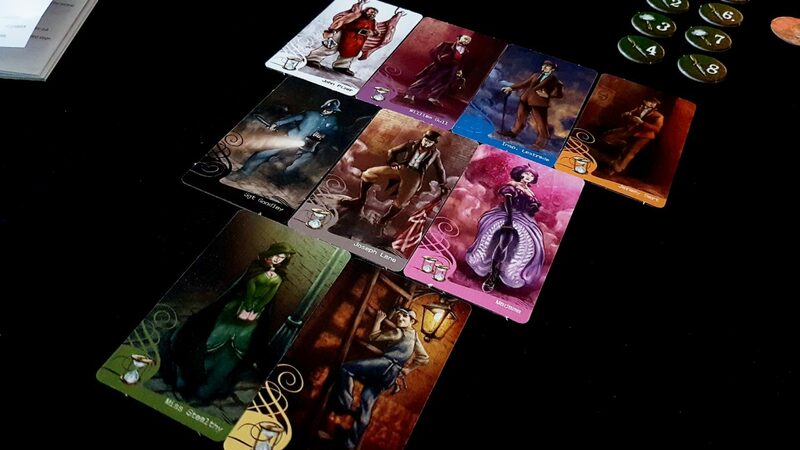 The only other kind of action is the alibi, and allows the player to draw a card from the suspect deck. If the investigators draw a card that is still represented on the grid, that suspect is cleared from the investigation. 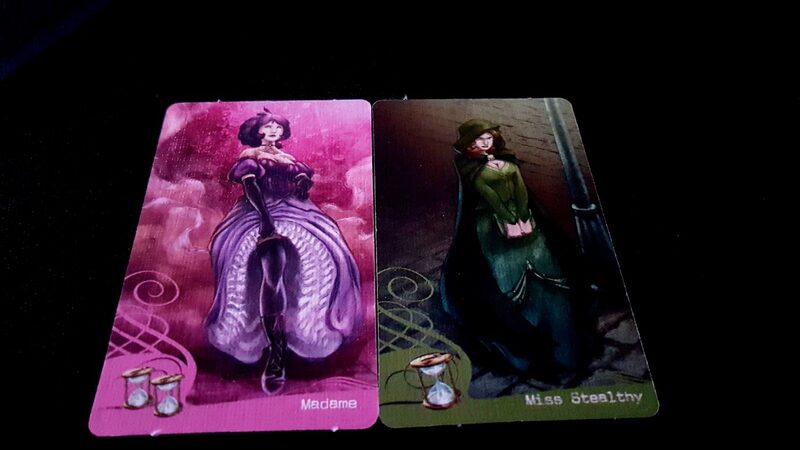 If Mr. Jack takes the card, he gets to add the number of hourglasses shown at the bottom to his own secret turn total – remember, when it reaches six he escapes the investigators. The turn counters before Jack are only part of the story – you never quite know when he’s going to slip between your fingers and into the cold mists of Victorian London. ‘I swear the wall moved!’, Watson would later yell between mouthfuls of sedatives. And leave Watson staring blankly at the walled up entry to Diagon Alley like the useless muggle he is. Or worse, engineer it so you need to move a detective out of the place you left them – those movement tiles aren’t optional, for the most part. Sometimes there are no good choices, and all you can do is watch one of your precious turns slip away from you. To begin with Whitechapel is a target rich environment. The investigators can’t wipe their arses without encountering a suspect in the toilet. Mr Jack’s job in the early game is to try to limit the number of suspects that the investigators can see every turn – especially if one of those suspects happens to be Mr Jack. 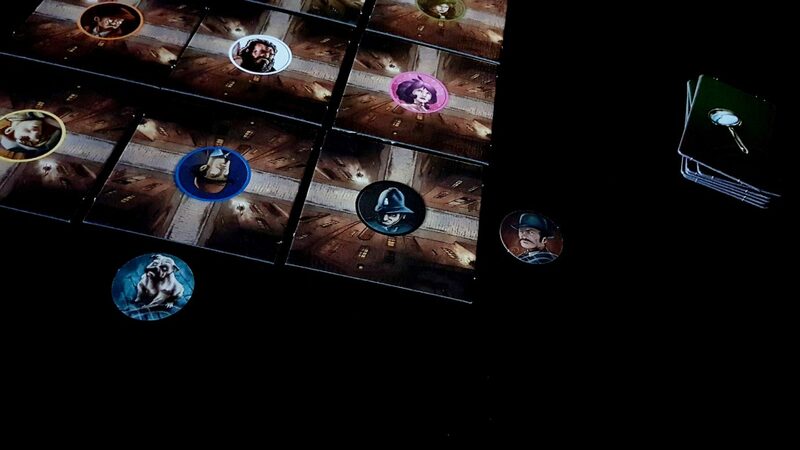 However, there’s a point before too much time has passed that the game changes and Mr Jack wants instead to make sure the investigators always see the suspects on the board. All the investigators get told is ‘You can see Mr Jack’, not who can see him. As such, you want to confuse and obfuscate as much as your little tiles will let you. If they’re always seeing the same faces in the crowd, any one of them can be the target. All you need to do as Mr Jack after all is delay the inevitable – collect the hourglasses, and prevent your discovery. It’s not enough for your opponent to know who the murderer may be – they have to prove it through suspect elimination. The odds may be on their side, but time is on yours. There’s a lot of game in this box. I was surprised by how much it packs into its tiny constraints. It’s a genuinely tense game of forced errors – like a tennis match, it’s not enough to hope that your opponent lobs a ball into the net. You need to position yourself so that the only thing they can do is make a mistake – they in turn are trying to do exactly the same to you. 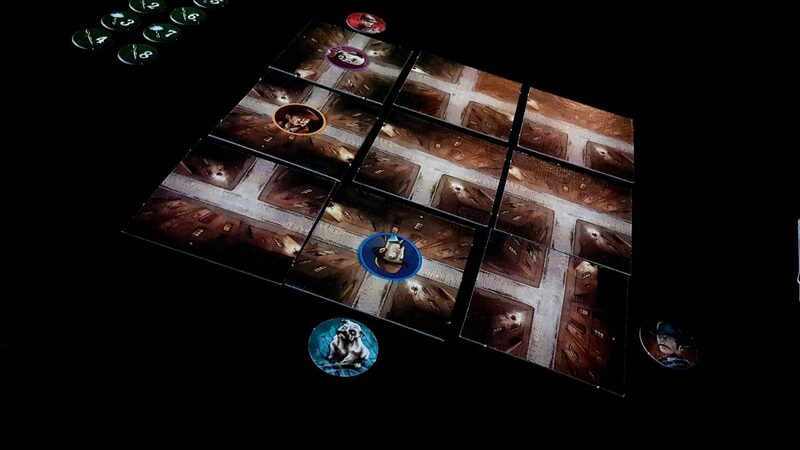 Despite the theme, this isn’t really a game of deduction – it’s a game of fencing with mechanics. Your opponent can point blank say ‘I’m John Smith’ and you’ll still need to methodically eliminate all the other suspects from the board. There are no sudden bursts of insightful brilliance in games of Mr Jack Pocket. In that sense it’s a theme at odds with its mechanics – you can use many words to describe Sherlock Holmes, but ‘workaday’ is not one of them. Holmes doesn’t exhaustively work his leads – he looks into the soul of the matter and arrives at a conclusion that is indistinguishable from witchcraft. Mr Jack is a game of minimaximal reasoning and the tension between the two players here is handled beautifully. The time constraints are so tight, and the actions so pivotal, that a bad choice can lose you the game. This isn’t just a case of picking the optimal action, this is finding the balance between maximising your benefit while minimising your liability, and doing the inverse for your opponent. You may only be choosing between four actions, but deciding upon which is best is like staring into the symbolic heart of the Matrix. Rarely do so few options generate so much second-guessing angst and so much buyer’s remorse. It’s pretty good! There may not be much to it, but what there is sharpened to an analytical knife-point. It’s going to slip into your grey-matter like a hot-knife into butter, and with much the same effect. Playing against a skilled opponent will superheat your synapses. There’s real triumph in success, and real recrimination in failure. And it all comes in a small box you can just about slip into a generously proportioned pocket. Not bad! Not bad at all.